Equivalent cheaper elsewhere? We'll do our best to match or beat it. UK approved quality fire safety. Peace-of-mind guaranteed. Knowing that your essential fire equipment is safe and protected from environmental conditions is crucial. We pride ourselves on stocking a varied range of fire storage and protection equipment. 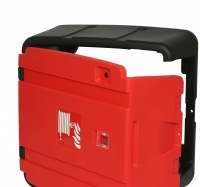 In our extensive range, you will find everything you and your customers could possibly need, including fire extinguisher cabinets, fire extinguisher points and stands, fire hose & extinguisher covers, fire safety document holders, fire site stands, mobile fire points, door seals and passive fire protection that can prevent ignition and slow the spread of fire. Free Next Day Delivery We now offer FREE delivery on all orders over £50 and its only a £5 charge for orders up to £50. Place an order for items in stock before 4pm and we’ll have it shipped and delivered by the next business day. Bulk Buy Mega Deals We offer bulk discounts. Please talk to our sales team for a quotation.